Note: After finishing 2nd in his first two starts, he finally broke his maiden in January at Gulfstream. He followed that with an allowance win also at Gulfstream, then finished third in the Blue Grass Stakes (G1) at Keeneland. 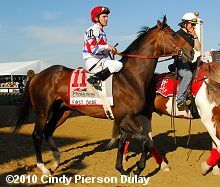 He set the pace in the Preakness, finishing second beaten just 3/4 length by Lookin at Lucky, followed by a third place finish, beaten just 1 length in the Belmont Stakes.